Sage 50 and QBO differ when it comes to affordability and the ability to meet the needs of certain industries. If you are a product-based business, go with Sage 50. However, if you sell services or you have simple inventory requirements, you can save a few bucks by choosing to use QuickBooks Online. QuickBooks Online is ideal for most small businesses because it is easy to navigate the program and is more affordable than Sage 50cloud. QBO pricing starts as low as $20 per month versus $44.97/month for Sage. Like Sage, QBO includes unlimited tech support via telephone or chat at no additional charge. Take it for a test drive free for 30 days. If you’re in the construction, manufacturing or distribution business, you should choose Sage 50cloud Quantum over QuickBooks Online. Sage 50cloud Quantum includes a customized chart of accounts, products and services list and other features specific to the construction, manufacturing and distribution businesses. Sage 50cloud Quantum is also robust enough to handle up to 40 users; pricing starts at $175.87/ month. If you’re strapped for cash and don’t have money to invest in QBO or Sage 50, Wave is a good alternative. Wave is a free accounting software you can use to manage all of your income and expenses. Unlike Sage 50 and QBO, Wave is not ideal for product-based businesses because inventory tracking and accounts payable are done manually in Wave. Accounting software should include features that allow you to track all of the financial activity for your business. We took both QuickBooks Online and Sage 50 (formerly known as Peachtree) for a test drive to assess how easy/difficult the products were to use. In addition, we looked at cost, ability to manage and pay bills, invoicing capabilities, and other features. Cost – what features you get for the price of the software. Ease of use/setup – navigating the program is easy and setup is not difficult. 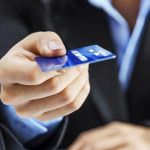 Manage accounts receivable – able to manage customer billing and payments. Manage accounts payable – able to manage vendor invoices and payments. Give multiple users access – can give anyone access to your data (e.g., bookkeeper). Customer support options – several options available to get help if you need it. Generate detailed reports – reports that give insight into the overall health of the business. After taking both QuickBooks Online and Sage 50cloud for a test drive and evaluating their ability to meet the above criteria, we have chosen QuickBooks Online over Sage 50 for most small businesses. QuickBooks Online beat Sage 50 in cost and ease of use; when it comes to cost, you can purchase QuickBooks for half the cost or less of any Sage 50cloud product. When it comes to ease of use, QBO is much more intuitive than Sage 50. While you can set up your business in QuickBooks without any bookkeeping knowledge, but I can’t say the same for Sage 50. Certain areas of the program, like chart of accounts and inventory management, are easier to set up if you have some accounting knowledge. As discussed, QuickBooks Online beats Sage 50cloud hands-down when it comes to cost. The most economical plan for Sage 50 is the pro plan, which at $44.97/month is more than double the cost of QBO Simple Start at $20/month! However, if you are in the construction, manufacturing or distribution industry, Sage 50cloud Quantum includes industry-specific features not offered by QBO. This includes features such as a chart of accounts, products and services lists and reports that are customized to meet your specific business. QBO has three pricing plans between $20 and $60 per month ($240 and $720 per year). The plans vary in number of users, built-in reports and other features. All three plans include between 20 and 65+ built-in reports, and all three plans include free live telephone and chat support. QBO Simple Start is ideal for solopreneurs who pay all of their bills through online banking or with a credit/debit card. If you need to keep track of unpaid bills, you will need to sign up for QuickBooks Online Essentials. QBO Essentials is ideal for a service-based business that prints checks to pay bills and does not have 1099 contractors. However, if you sell products or need to keep track of payments made to 1099 contractors, you will need to sign up for the QBO Plus plan. QBO Plus is ideal for a business that sells products and needs to track inventory cost and quantities. QBO Plus also allows you to track and pay 1099 contractors and do budgeting/forecasting. Like Sage 50, QBO allows you to create custom invoices that include your logo and brand colors. In addition, you can email invoices to customers and easily track customer payments. A detailed accounts receivable aging report is available for you to run for a specified time frame so you can stay on top of invoices that are coming due or are past due. QBO includes the ability to manage and pay bills in two out of their three pricing plans, whereas Sage 50 includes it in all three of their plans. QBO Simple Start does not include accounts payable, which means that you cannot keep track of unpaid bills. However, you can download bill payments made through your bank/credit card accounts. When it comes to giving other people access to your data, both QBO and Sage 50cloud have this feature in their mid-tier and top tier plans. QBO Essentials allows you to give up to three users and two accountants access and QBO Plus includes up to five users and two accountants. If you hire a 1099 contractor, you will need to purchase QBO Plus. It is the only QBO pricing plan that includes 1099 tracking and reporting. This is a feature that is not included in any of the Sage 50 pricing plans. Sage 50cloud offers three pricing plans like QuickBooks Online. Plans run between $44.97 and $175.87 per month for one user. All plans include an extensive library of reports, starting at 93 reports in the Pro plan. Similar to QuickBooks, all plans include unlimited telephone and chat support. You can also add the Office 365 integration for an additional $12.50 per month. Sage 50cloud Pro is ideal for a solopreneur or startup that sells products or services and doesn’t need to give other users access to their data. You can track accounts payable, accounts receivable and access up to 93 detailed reports/dashboards. Sage 50cloud Premium is ideal for a small business that sells products or services and needs to give no more than five users access to their data (additional fees will apply to add more users). This plan includes everything that the Pro plan includes plus budgeting, forecasting and job costing tools. When it comes to reports and dashboards, Sage 50cloud has many more reports and dashboards than QBO does. Sage provides extensive inventory reports, job costing, project tracking and advanced budgeting and forecasting reports that go beyond the standard reports offered in QBO. You can keep track of all product orders, purchases and payments in Sage 50. Similar to QBO, this means you can create purchase orders and track product receipts, and the software will automatically keep track of cost and quantities. Budgeting and forecasting is available in Sage 50cloud Premium and Quantum plans only. These plans include a great deal more advanced budgeting and forecasting reports than you will find in QBO Plus. For example, you can run budget to actual reports comparing year-to-date income and expenses to two budgets or you can run a report that will compare income and expenses to a revised budget. Both Sage 50cloud and QuickBooks Online are very user-friendly and easy to navigate. Both programs have a left menu bar. Unlike QBO, Sage also has a menu bar located at the top of the login screen. 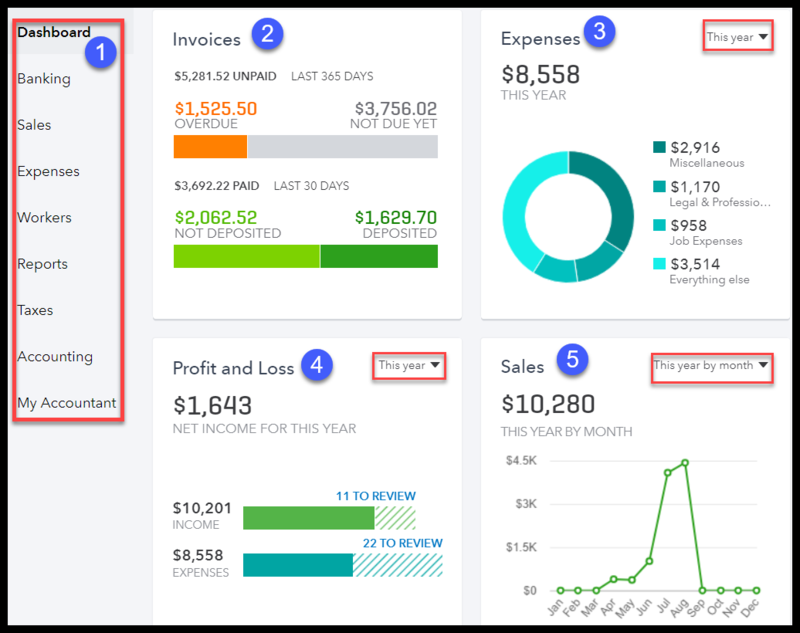 When you log in to Sage 50 and QBO, you immediately see a business insights page that is easily customizable to show key data points such as revenue and account balances. Similar to Sage 50, QBO is easy to navigate. It has a colorful homepage with a dashboard to give you a snapshot into every aspect of your business, such as invoices, expenses, profit and loss and sales. Similar to Sage 50, QBO has a menu bar located on the left side of the screen. Here is a snapshot of the dashboard you will see once you log in to your QBO account. Below, we have provided a brief explanation of the information you will find here. 1. Left Menu Bar: To navigate the program, just make your selections from the left menu bar. 2. Invoices: In this section, you will find invoices that are overdue, invoices that are not due yet, payments received that have been deposited, and payments not deposited yet. 3. Expenses: In this section, you will find a snapshot of the total expenses along with the top three expenses for your business. In the above example, the top three expenses are Miscellaneous, Legal & Professional, and Job Expenses. 4. Profit and Loss: Keep tabs on your profit/loss status by reviewing this section. Select the time period you prefer from the drop-down arrow located in the right corner. 5. Sales: Stay on top of sales by reviewing this section, which shows the total amount for the year ($10,280). A graph that shows sales by month also appears here, and you can choose the time period from the drop-down in the upper right hand corner. Like QBO, Sage 50 has a very intuitive user interface. The Business Status page is similar to the QBO dashboard in that it gives you insights into your revenue, profit, outstanding bills and open customer invoices. You can customize this page to show the data that you are most interested in. Here is a snapshot of the dashboard you will see once you log in to your Sage 50cloud account. Below, we have provided a brief explanation of the information you will find here. 1. Account Balances – In this section, you will see your chart of accounts list and the current balances for each account. 3. Aged Payables – This section shows a snapshot of an A/P aging report, which shows your open bills that are current and past due. 4. Aged Receivables – This section shows a snapshot of an A/R Aging report, which shows your unpaid customer invoices that are current and past due. Both Sage 50 and QuickBooks Online offer a number of resources for customers to access if they get stuck or have a question. Both offer live telephone and chat support, self-service options and training video tutorials. Whether you prefer to pick up the phone and talk to a live person or search for answers to questions on your own, QBO has a variety of free customer support options that include video tutorials, chat and a database with articles that include step-by-step instructions. QBO Learn & Support – Check out the Learn & Support page if you don’t mind doing a little research. They have a list of the most frequently asked questions along with a search box that you can use to locate the answers to your questions. Chat – Access to a live chat support agent is included in all QBO plans. All you have to do is log in to your QBO account and click on the Help option to get started. Phone – Customer support agents are available Monday through Friday, 6 a.m. to 6 p.m. PST and Saturdays, 6 a.m. to 3 p.m. PST. Email – If you can’t find the answer to your question, submit a detailed question to the support team via email; you can generally expect a response within 48 hours. Fit Small Business QuickBooks Course – This free course was designed to help small businesses like you get up and running quickly. Each video tutorial includes written instructions on how to set up QuickBooks. Similar to QBO, Sage 50 offers several customer support channels. If you prefer to speak to a live person, you can give them a call or start a chat session right within your Sage account. If you don’t mind doing a little digging, you can use the knowledge base to look at FAQs and search for answers. Phone – Similar to QBO, telephone support is included in all Sage 50 plans. Chat – You can access a live chat support agent by logging into your account and going to the Help menu. Knowledge base – This database includes answers to frequently asked questions, product downloads and the latest updates to the software. Forums – You can access a community of business owners like yourself who post questions that get answered by certified Sage advisors, bookkeepers and accountants. Sage University – Access a library of on-demand training resources specifically tailored to the Sage products that you use for your business; additional fees may apply. Fit Small Business Forum – If you can’t find an answer to your question, post it in our forum. We answer questions posted by small businesses like yourself every day! Sage 50 and QBO have positive and negative customer reviews. On the positive end, customers like how easy QBO is to set up and bookkeepers and accountants like using Sage 50. On the negative end, QBO customers feel some tasks are much slower than others when using the mobile app, and Sage customers feel that if you don’t have bookkeeping knowledge, the program can be difficult to use. We’ve synthesized online reviews so you can more easily compare Sage 50 vs. QuickBooks Online. QBO customers have both positive and negative QuickBooks online reviews. On the positive side, customers like how easy QBO is to set up and they like using the app to manage most tasks from their mobile device. On the negative end, customers have complained that reviewing reports on a mobile device is slower than it is if you are logged into a desktop computer. Check out all of our QuickBooks online reviews to learn more. Overall, Sage reviews are mixed. To summarize, users said if you have an accounting or finance background, Sage 50 is easy to use. However, if you don’t have any bookkeeping or accounting knowledge, you may need to hire an expert to get assistance. Read all of our customer reviews on the Sage 50 customer reviews page. Have a question about choosing the right accounting service for your business? Our analysts are standing by to answer! After reviewing Sage 50 vs. QuickBooks Online, the clear winner is QuickBooks Online. If you’re in the construction, manufacturing or distribution industries, Sage 50 Quantum is ideal for you. However, if you’re not in one of these industries, QuickBooks Online is your best bet because it is much more affordable and you can set it up yourself without the need to hire an expert. We’ve even created a free QuickBooks Course to teach you all of the basics. It takes just a few minutes to get started with QuickBooks Online, the most widely-used small business accounting software. Its scalability makes it perfect for both solopreneurs and small-to-medium sized businesses that are growing. Sign up for a free 30-day trial and check it out for yourself.